Yum! 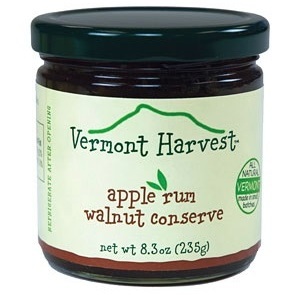 A unique blend of fruit, raisins, walnuts and spices, Apple Rum Walnut Conserve is the perfect complement to breakfast toast and homemade muffins, but don't stop there! Combined with Vermont cheddar cheese as a snack on crackers. For a delicious turkey stuffing; bring 1 cup of water to a boil in a saucepan with 1 stick butter and heat until butter is melted. Then, add 7 oz. of your favorite stuffing mix with 1 chopped apple, 1 cup Apple Rum Walnut Conserve, and 1/2 cup of raisins to saucepan. Enough to stuff an 8 to 10 lb. turkey.